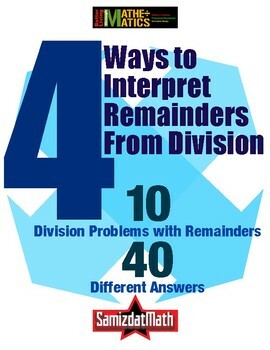 Interpreting Division Remainders: 10 problems, 4 different ways to solve ! 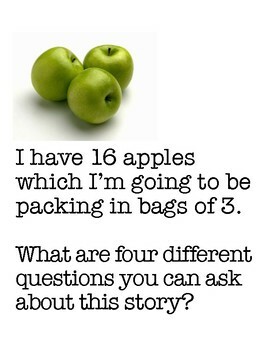 Your students are "learning" about division, and if you're using a really, really cruddy curriculum, then they probably all sound like this: "I have 24 blah blah blahs which I'm packing into cases of (choose some divisor of 24.) How many cases will I be able to make. 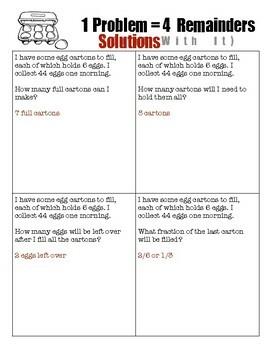 This, my friends, is a lackadaisical and churlish approach to teaching students about solving problems with division. The facts are these: 99% of all "real" division problems that your students will actually be asked to solve will NOT come out "evenly." This is because chickens do not lay eggs in multiples of 13, buses are not built in multiples of 30 and you can only invite a multiple of 8 people to eat pizza! No!!!! The fact is that your students should expect that a division problem should not come out evenly and be prepared to answer it intelligently on that basis. 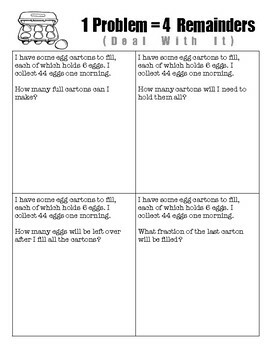 This means that if there are 33 eggs collected, your students will know that the answer can either be a) 2 full cartons of 12 eggs can be made, or 3 12-egg cartons will be needed to hold all the eggs, or that 9/12 (a.k.a. 3/4) of the last carton will be full, or that 1/4 of the last carton will be empty, or that you'll need 3 more eggs to complete the last carton, etc. etc. This is a collection of 10 different "real life" examples of division (at least, as real as an elementary school kid can imagine, without being "phony" like those stupid boos that propose preposterous situations like a blogger writing 114 blog posts in one week so that we have an excuse to calculate 114 ÷ 7....) with 4 different ways of interpreting the remainders. It is an excellent way for your students to understand how to understand division and interpret the remainders that almost always emerge from this process.